Each year, students from the EADA finance masters have the option of participating in an international business trip to financial capital of Frankfurt. We spoke to current International Master in Finance participant Marwan Auda about his experience there. The first day, we visited Deutsche Bank HQ for an instructive session with VP Dr. Michael Adams. During this session, we learned about how universal banks operate with special insight into Deutsche Bank’s position and strategy. Dr. Adams emphasised the particular challenges of abiding by each country’s regulations for a bank with offices all over the world. He explained the responsibilities of the different departments in such an enormous bank and the role of each in generating revenue. With my background in banking, the discussion was particularly interesting to me. I was able to relate and compare how banks’ exposure, size and location could significantly affect its strategies and policies. After the introduction, Dr. Adams moved on to talk about Deutsche Bank’s FX risk management. He debated that the fixed exchange rates are bound to one of two factors, open capital markets or independent monetary policy. It was interesting to learn how risks are handled by DB regarding FX trading and the tactics adopted to hedge them to avoid potential adverse fluctuations in the market. Dr. Adams also raised concerns about various issues regarding the Brexit, the current negative interest rates, the slowdown in the economy, the bank’s position towards technological advances, and the latest downsizing DB is undertaking in Latin America. The second stop on the trip was the European Central Bank (ECB), where we met with Dr. Arne Gieseck, Adviser in the Output and Demand Division. Dr. Gieseck provided an informative talk about the macroeconomic developments and current challenges for the Euro. He also discussed how the world is reacting in terms of economic growth and other essential macroeconomic indicators, touching on the policies established by developed countries to sustain growth and those adopted by developing countries to thrive and rise. He mentioned the challenges the ECB is currently facing regarding Brexit and negative interest rates, as well as the quantitative easing policies it is currently embracing to boost the European economy. The trip was fruitful and well organized; the opportunity to visit leading financial institutions was valuable in terms of learning and exposure. 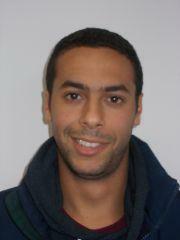 Marwan Auda is a current Egyptian participant in the International Master in Finance. He received a Bachelor of Arts with honors from the American University in Cairo, majoring in economics and minoring in business administration. He has worked as a Senior Credit Analyst at Ahli United Bank Egypt, where he analyzed the credit worthiness of corporate clients and managed the growth of a diversified portfolio.